Facebook Messenger is a new app that brings Facebook to your desktop. While you surf the web or use other applications on your computer, you can chat and message with your friends on Facebook, See the latest updates from your friends in ticker, Get quick notifications about what’s going on. Messenger lets you use Facebook without being on www.facebook.com. You will now be able to stay in touch anytime, no matter what you're doing. You can set up the app if you use Windows 7 on your computer. Facebook Messenger does not currently support Windows Vista and Windows XP. By default, the this app is undocked. So you can easily move it around your computer screen (just click the top of the sidebar and drag it with your mouse). When it's undocked you can also close the sidebar by clicking the 'x' and still get notifications and chats. When you dock the window, it stays on the right side of your screen. Save "Facebook Messenger" setup file to your computer. When finish download, open the setup file and wait. Facebook Messenger will automatically install to your computer with in few seconds. 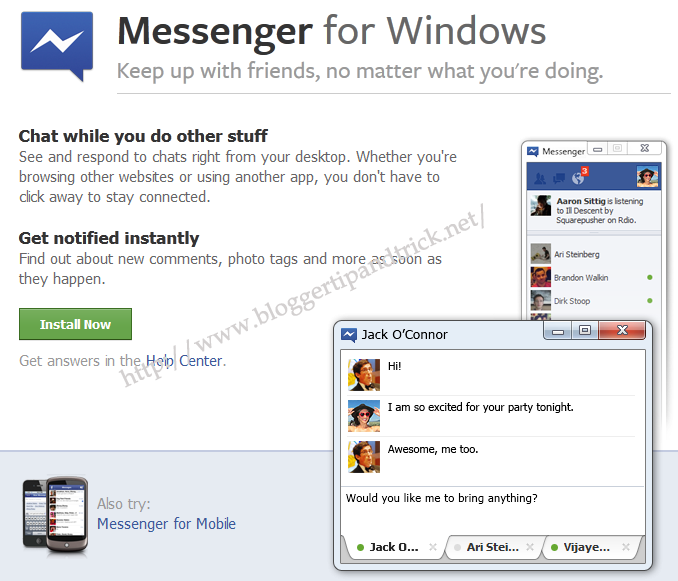 When you installed and open Messenger for the first time, you will be logged in automatically. From then on, you'll need to log in from the app and not from your browser. « Web Designer Pro Bundle – for a Unbeatable Value (20$) !!! Nice information, Thanks you vary much. Man you are famous for making themes arent you ?? thanks for the tutorial.. i've been looking for this..